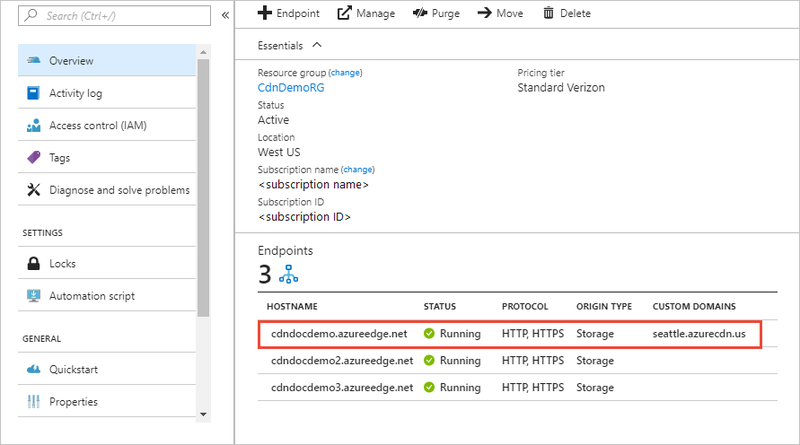 This tutorial shows how to enable the HTTPS protocol for a custom domain that's associated with an Azure CDN endpoint. By using the HTTPS protocol on your custom domain (for example, https://www.contoso.com), you ensure that your sensitive data is delivered securely via TLS/SSL encryption when it is sent across the internet. When your web browser is connected to a web site via HTTPS, it validates the web site’s security certificate and verifies it’s issued by a legitimate certificate authority. This process provides security and protects your web applications from attacks. Azure CDN supports HTTPS on a CDN endpoint hostname, by default. For example, if you create a CDN endpoint (such as https://contoso.azureedge.net), HTTPS is automatically enabled. No additional cost: There are no costs for certificate acquisition or renewal and no additional cost for HTTPS traffic. You pay only for GB egress from the CDN. Simple enablement: One-click provisioning is available from the Azure portal. You can also use REST API or other developer tools to enable the feature. Complete certificate management is available: All certificate procurement and management is handled for you. Certificates are automatically provisioned and renewed prior to expiration, which removes the risks of service interruption due to a certificate expiring. Enable the HTTPS protocol on your custom domain. Disable the HTTPS protocol on your custom domain. 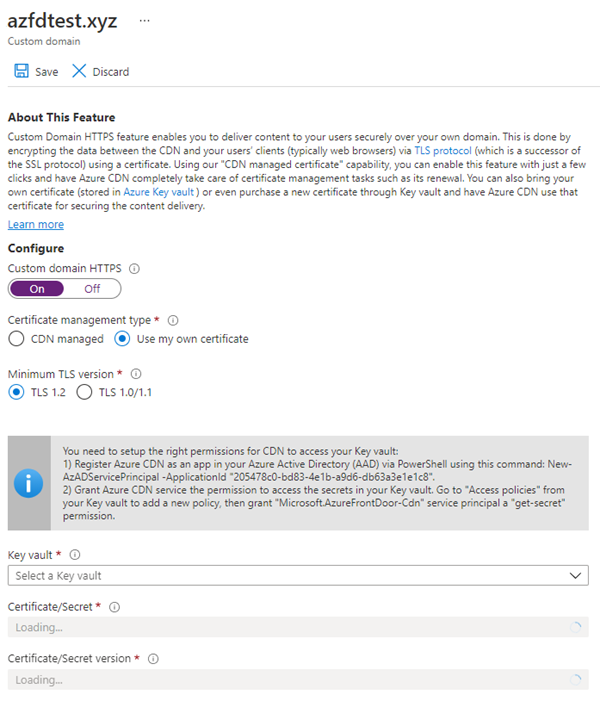 To enable the HTTPS protocol for securely delivering content on an Azure CDN custom domain, you must use an SSL certificate. 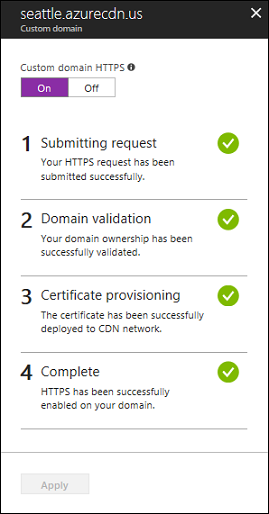 You can choose to use a certificate that is managed by Azure CDN or use your own certificate. When you use a CDN-managed certificate, the HTTPS feature can be turned on with just a few clicks. Azure CDN completely handles certificate management tasks such as procurement and renewal. After you enable the feature, the process starts immediately. If the custom domain is already mapped to the CDN endpoint, no further action is required. Azure CDN will process the steps and complete your request automatically. However, if your custom domain is mapped elsewhere, you must use email to validate your domain ownership. In the Azure portal, browse to your Azure CDN Standard from Microsoft, Azure CDN Standard from Akamai, Azure CDN Standard from Verizon or Azure CDN Premium from Verizon profile. In the list of CDN endpoints, select the endpoint containing your custom domain. In the list of custom domains, select the custom domain for which you want to enable HTTPS. The Custom domain page appears. Under Certificate management type, select CDN managed. Select On to enable HTTPS. Proceed to Validate the domain. 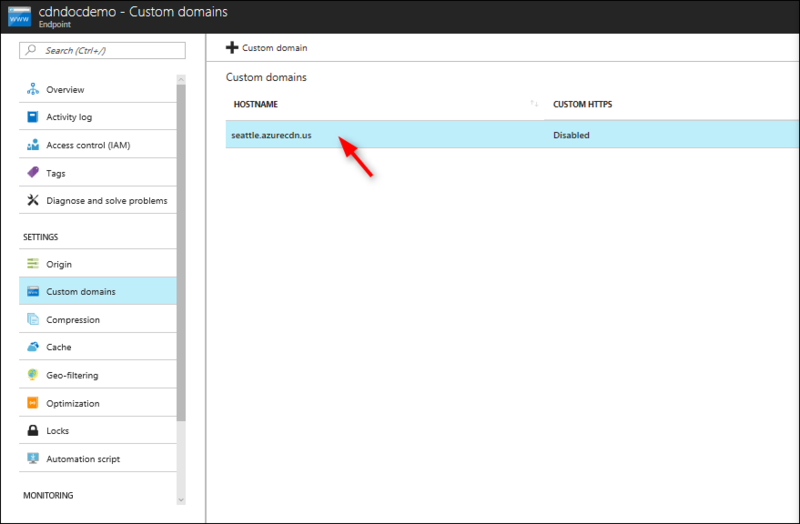 This option is available only with Azure CDN Standard from Microsoft profiles. You can use your own certificate to enable the HTTPS feature. This process is done through an integration with Azure Key Vault, which allows you to store your certificates securely. 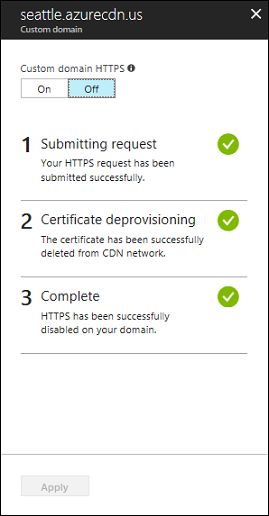 Azure CDN uses this secure mechanism to get your certificate and it requires a few additional steps. When you create your SSL certificate, you must create it with an allowed certificate authority (CA). Otherwise, if you use a non-allowed CA, your request will be rejected. For a list of allowed CAs, see Allowed certificate authorities for enabling custom HTTPS on Azure CDN. 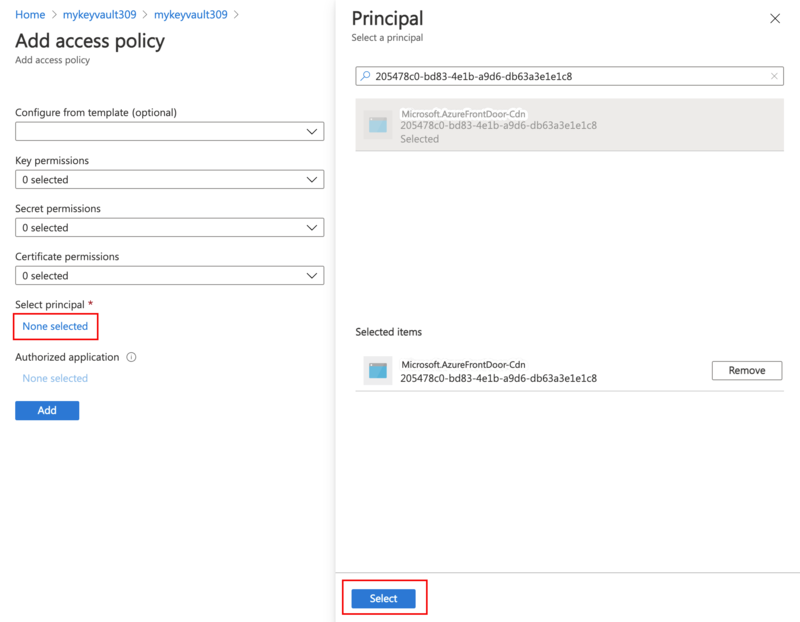 Azure Key Vault: You must have a running Azure Key Vault account under the same subscription as the Azure CDN profile and CDN endpoints that you want to enable custom HTTPS. Create an Azure Key Vault account if you don’t have one. Azure Key Vault certificates: If you already have a certificate, you can upload it directly to your Azure Key Vault account or you can create a new certificate directly through Azure Key Vault from one of the partner CAs that Azure Key Vault integrates with. Register Azure CDN as an app in your Azure Active Directory via PowerShell. If needed, install Azure PowerShell on your local machine. Grant Azure CDN permission to access the certificates (secrets) in your Azure Key Vault account. 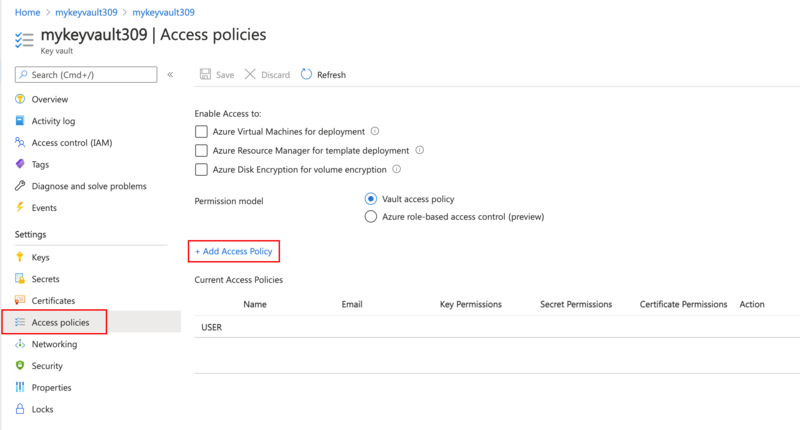 In your key vault account, under SETTINGS, select Access policies, then select Add new to create a new policy. In Select principal, search for 205478c0-bd83-4e1b-a9d6-db63a3e1e1c8, and choose Microsoft.Azure.Cdn. Click Select. In Secret permissions, select Get to allow CDN to perform these permissions to get and list the certificates. Azure CDN can now access this key vault and the certificates (secrets) that are stored in this key vault. Return to the Azure CDN portal and select the profile and CDN endpoint you want to enable custom HTTPS. Under Certificate management type, select Use my own certificate. Select a key vault, certificate (secret), and certificate version. The key vault accounts for your subscription ID. The certificates (secrets) under the selected key vault. When you use your own certificate, domain validation is not required. Proceed to Wait for propagation. Custom domain is mapped to your CDN endpoint. Otherwise, if the CNAME record entry for your endpoint no longer exists or it contains the cdnverify subdomain, proceed to Custom domain is not mapped to your CDN endpoint. When you added a custom domain to your endpoint, you created a CNAME record in the DNS table of your domain registrar to map it to your CDN endpoint hostname. If that CNAME record still exists and does not contain the cdnverify subdomain, the DigiCert CA uses it to automatically validate ownership of your custom domain. If you're using your own certificate, domain validation is not required. For more information about CNAME records, see Create the CNAME DNS record. If your CNAME record is in the correct format, DigiCert automatically verifies your custom domain name and creates a dedicated certificate for your domain name. DigitCert won't send you a verification email and you won't need to approve your request. The certificate is valid for one year and will be auto-renewed before it expires. Proceed to Wait for propagation. Automatic validation typically takes a few mins. If you don’t see your domain validated within an hour, open a support ticket. If you have a Certificate Authority Authorization (CAA) record with your DNS provider, it must include DigiCert as a valid CA. A CAA record allows domain owners to specify with their DNS providers which CAs are authorized to issue certificates for their domain. If a CA receives an order for a certificate for a domain that has a CAA record and that CA is not listed as an authorized issuer, it is prohibited from issuing the certificate to that domain or subdomain. For information about managing CAA records, see Manage CAA records. For a CAA record tool, see CAA Record Helper. If the CNAME record entry for your endpoint no longer exists or it contains the cdnverify subdomain, follow the rest of the instructions in this step. Email validation of custom domain ownership is currently unavailable for Azure CDN from Akamai profiles. This feature is currently in our backlog. After you submit a request to enable HTTPS on your custom domain, the DigiCert CA validates ownership of your domain by contacting its registrant, according to the domain's WHOIS registrant information. Contact is made via the email address (by default) or the phone number listed in the WHOIS registration. You must complete domain validation before HTTPS will be active on your custom domain. You have six business days to approve the domain. Requests that are not approved within six business days are automatically canceled. You should receive an email in a few minutes, similar to the following example, asking you to approve the request. If you are using a spam filter, add admin@digicert.com to its whitelist. If you don't receive an email within 24 hours, contact Microsoft support. You can approve all future orders placed through the same account for the same root domain; for example, contoso.com. This approach is recommended if you plan to add additional custom domains for the same root domain. You can approve just the specific host name used in this request. Additional approval is required for subsequent requests. 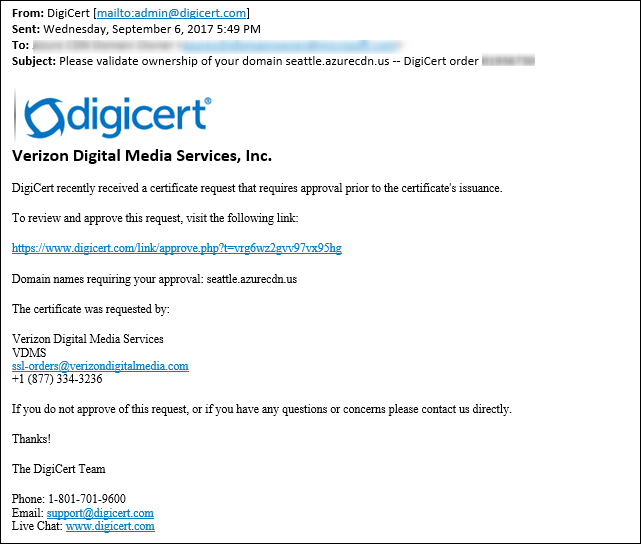 After approval, DigiCert completes the certificate creation for your custom domain name. The certificate is valid for one year and will be auto-renewed before it's expired. After the domain name is validated, it can take up to 6-8 hours for the custom domain HTTPS feature to be activated. When the process is complete, the custom HTTPS status in the Azure portal is set to Enabled and the four operation steps in the custom domain dialog are marked as complete. Your custom domain is now ready to use HTTPS. The following table shows the operation progress that occurs when you enable HTTPS. After you enable HTTPS, four operation steps appear in the custom domain dialog. As each step becomes active, additional substep details appear under the step as it progresses. Not all of these substeps will occur. After a step successfully completes, a green check mark appears next to it. Your HTTPS request is being submitted. Your HTTPS request has been submitted successfully. 2 Domain validation Domain is automatically validated if it is CNAME mapped to the CDN Endpoint. Otherwise, a verification request will be sent to the email listed in your domain’s registration record (WHOIS registrant). Please verify the domain as soon as possible. Your domain ownership has been successfully validated. 3 Certificate provisioning The certificate authority is currently issuing the certificate needed to enable HTTPS on your domain. The certificate has been issued and is currently being deployed to CDN network. This could take up to 6 hours. The certificate has been successfully deployed to CDN network. 4 Complete HTTPS has been successfully enabled on your domain. * This message doesn't appear unless an error has occurred. We encountered an unexpected error while processing your HTTPS request. Please try again and contact support if the issue persists. In the Azure portal, browse to your Azure CDN Standard from Microsoft, Azure CDN Standard from Verizon or Azure CDN Premium from Verizon profile. In the list of endpoints, click the endpoint containing your custom domain. Click the custom domain for which you want to disable HTTPS. Click Off to disable HTTPS, then click Apply. After the custom domain HTTPS feature is disabled, it can take up to 6-8 hours for it to take effect. When the process is complete, the custom HTTPS status in the Azure portal is set to Disabled and the three operation steps in the custom domain dialog are marked as complete. Your custom domain can no longer use HTTPS. The following table shows the operation progress that occurs when you disable HTTPS. After you disable HTTPS, three operation steps appear in the Custom domain dialog. As each step becomes active, additional details appear under the step. After a step successfully completes, a green check mark appears next to it. Who is the certificate provider and what type of certificate is used? 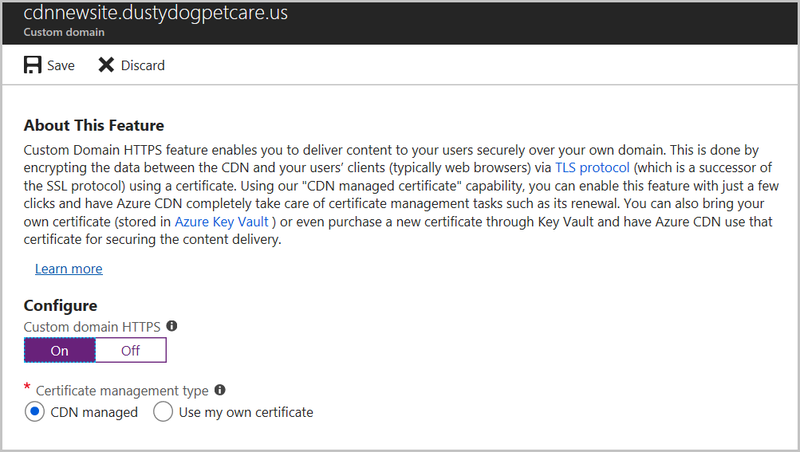 For both Azure CDN from Verizon and Azure CDN from Microsoft, a dedicated/single certificate provided by Digicert is used for your custom domain. Do you use IP-based or SNI TLS/SSL? Both Azure CDN from Verizon and Azure CDN Standard from Microsoft use SNI TLS/SSL. What if I don't receive the domain verification email from DigiCert? If you have a CNAME entry for your custom domain that points directly to your endpoint hostname (and you are not using the cdnverify subdomain name), you won't receive a domain verification email. Validation occurs automatically. Otherwise, if you don't have a CNAME entry and you haven't received an email within 24 hours, contact Microsoft support. Is using a SAN certificate less secure than a dedicated certificate? A SAN certificate follows the same encryption and security standards as a dedicated certificate. All issued SSL certificates use SHA-256 for enhanced server security. Do I need a Certificate Authority Authorization record with my DNS provider? No, a Certificate Authority Authorization record is not currently required. However, if you do have one, it must include DigiCert as a valid CA. 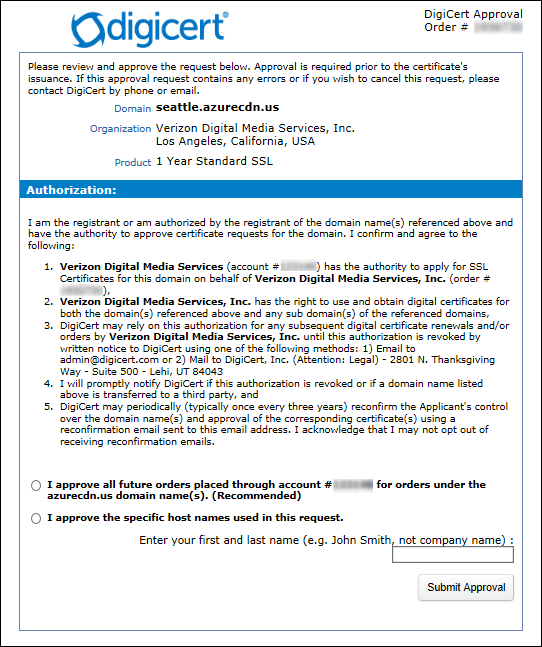 On June 20, 2018, Azure CDN from Verizon started using a dedicated certificate with SNI TLS/SSL by default. What happens to my existing custom domains using Subject Alternative Names (SAN) certificate and IP-based TLS/SSL? Your existing domains will be gradually migrated to single certificate in the upcoming months if Microsoft analyzes that only SNI client requests are made to your application. If Microsoft detects there some non-SNI client requests made to your application, your domains will stay in the SAN certificate with IP-based TLS/SSL. In any case, there will be no interruption to your service or support to your client requests regardless of whether those requests are SNI or non-SNI. Advance to the next tutorial to learn how to configure caching on your CDN endpoint.